Income investors don't have to settle for weak dividend growth and soft sales gains. Procter & Gamble (NYSE:PG) is flush with cash thanks to a portfolio reboot that's involved selling off a few valuable brands, including Duracell batteries and Coty beauty products. Yet weak operating trends have produced two consecutive years of disappointing dividend raises for income investors. The consumer products giant boosted its payout by 3% last year and by just 1% in 2016. So today I'm looking at Target (NYSE:TGT), Coca-Cola (NYSE:KO), and Johnson & Johnson (NYSE:JNJ): Three stocks that investors might prefer over P&G right now. Here's how the dividends stack up against each other. Data sources: Company financial filings and S&P Capital IQ data. Last raise is the most recent percent change in the dividend. Target's stock is out of favor right now in part due to a slowdown in the retailing industry. Yet the company has stumbled enough to separate itself from peers -- and not in a good way. Customer traffic dropped last quarter, even as Wal-Mart's rose. And Target's comparable-store sales are negative at the same time that grocery competitor Kroger has pushed its growth streak past 50 straight quarters. 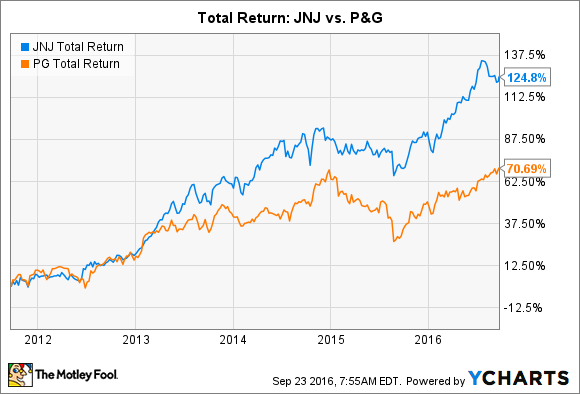 Johnson & Johnson may not pay as meaty a yield as P&G right now (2.7% vs. 3%), but that's partly because the stock is up so sharply. Shares have more than doubled over the last five years including dividend reinvestments, compared to a market-lagging 71% rise for P&G. Its dividend growth rate is impressive, too: J&J's payout has improved at a 7% compound annual rate over the last five years and by nearly 9% over the past decade. Yet one of the best reasons to like J&J over Procter & Gamble is that, while both companies admit that innovation is critical to their entire business model, only one has demonstrated consistent success at it. Johnson & Johnson dedicates $9 billion to research and development each year and investors see the fruits of that spending: Roughly 25% of sales last year came from products that J&J introduced in just the past five years. In contrast, P&G hasn't launched a new $1 billion product in over a decade.